The north-central section of Phoenix is bordered approximately by I-17 in the west and the Phoenix Mountains to the east, with most shops, hotels and business parks along the interstate corridor; the main commercial center is in and around the huge Metrocenter Mall, which contains a movie theater (12 screen) and over 100 stores. This lies about half way, 7 miles, between downtown Phoenix and the north edge of the city, beyond Loop 101. 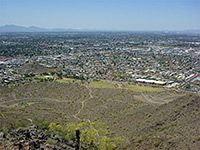 Although most of the area is developed, there are a few natural areas amidst the urban surroundings including North Mountain Preserve and the valley of Cave Creek. Although well within the Phoenix city limits, Pointe Hilton Tapatio Cliffs is entirely surrounded by pristine desert hills, part of North Mountain Park; the upscale resort is located along an otherwise undeveloped one mile section of 7th Street, between a residential district to the south and Thunderbird Road to the north, along which are found a few restaurants and shops. Centerpiece of the site is Falls Water Village, featuring no fewer than 8 pools, plus waterfalls and tennis courts, all surrounded by flourishing tropical plants. 23 meeting rooms cater for a wide range of events, up to 2,200 people. The resort has five restaurants, including a poolside cafe and the Mediterranean-influenced Different Pointe of View, which provides stunning views of the desert from floor-to-ceiling windows. Pointe Hilton Squaw Peak Resort occupies a beautiful, 27 acre site at the foot of the Phoenix Mountains, close to the 51 freeway; the luxurious, all-suite accommodations are divided into many small blocks along tree-lined streets, centered around an extensive recreation area with swimming pools, waterfalls, a river, miniature golf, tennis courts and a childrens' adventure camp. There are 546 suites available, including a selection of two-level casitas; many have a kitchenette. The 10,000 sq ft Tocasierra Spa & Salon offers a wide range of treatments and services. Three on-site restaurants are the Western-themed, family-style Hole-in-the-Wall, Rico's American Grill (with the option of patio dining), and Slim Picken's, serving drinks & snacks beside the main pool. The 284 room/suite DoubleTree (open summer 2017) is the closest hotel to Metro Center Mall in north central Phoenix, located within the Metro Parkway ring road, close to the Peoria Avenue exit of Interstate 17. This is a luxurious property occupying several old-style, mid-rise buildings arranged around a central garden, which contains a good sized outdoor pool and plenty of shady trees. An onsite restaurant/bar (Brixton Pub) serves breakfast, lunch, dinner, room service and evening drinks, while there are numerous other restaurants a short walk away. A complimentary shuttle is available to places within a five mile radius. The business center and fitness center are both open 24 hours a day. Holiday Inn North Phoenix provides a full range of amenities, together with stylish, modern accommodations and excellent customer service. The 174 room/suite property sits beside I-17 at the Cactus Road exit, close to a few shops and restaurants, one mile north of the much greater selection at Metrocenter Mall. All day dining (plus room service and evening drinks) is available at the hotel's American-style Pickle Back Bar & Grille, while the many other facilities include an outdoor pool/whirlpool, business center and fitness center (both open 24 hours), convenience store and 2,500 square feet of meeting space, catering for events of up to 125 people. One of several hotels next to interstate 17 on the opposite side to the Metro Center Mall in north Phoenix, the three star Courtyard by Marriott has the familiar design for this brand based on a central landscaped garden with palm trees and an outdoor pool, overlooked by many of the 146 large, clean rooms & suites. The on site cafe serves breakfast only but there is no shortage of restaurants close by, plus a 24 hour market in the lobby where drinks and snacks can be purchased. Other facilities include a fitness center, hot tub, guest laundry, and 2 meeting rooms. Next to interstate 17 (exit 206; Northern Avenue), the all suite Residence Inn Phoenix caters mainly to the extended stay market, all the rooms containing separate sleeping/living areas plus a full kitchen. The hotel has the old style layout for this brand with the 168 rooms divided into a number of two floor blocks linked by tree-lined walkways; at the center of the complex is an outdoor pool, hot tub and sundeck. Free hot breakfast is served each day, plus a free light dinner during the week (Monday to Thursday). The neighborhood is mostly residential but there are many shops and restaurants 1.3 miles north at the Metro Center Mall. Homewood Suites by Hilton is part of a line of hotels on the east side of interstate 17 south of Peoria Avenue, opposite the huge Metrocenter Mall and also near Cave Creek Park, Lake Biltmore Village, Metro Square and a number of corporate headquarters. The long stay hotel has a good range of facilities for business (meeting rooms, A/V equipment, business center) and leisure (outdoor pool, whirlpool, basketball court, fitness center), plus other useful amenities like a gift shop and convenience store. The modern suites all have a fully equipped kitchen and plenty of space for work and relaxation. Complimentary amenities include hot breakfast and evening reception (light meal and drinks), Monday to Thursday. Right next to its Marriott sister property the SpringHill Suites (a little further away from the main road) stands the 94 room TownePlace Suites Phoenix, comprising two blocks either side of the parking lot and outdoor pool. Free continental breakfast is served each morning, and for other meals, there are several restaurants a block or two north and many more at the Metro Center Mall on the far side of I-17; alternatively, guests can cook meals in their room, as this includes a full kitchen with dishwasher, oven, microwave and refrigerator. Also just across the interstate is the popular Castles'N Coasters fun park. The hotel has a business center though no meeting space, however this is available at the adjacent Black Canyon Conference Center. Of two adjacent all suite Marriott hotels near the Metro Center Mall in north Phoenix, the SpringHill Suites has slightly lower rates than its neighbor the TownePlace Suites, though both are clean, modern, well managed establishments. The hotel has 81 studio suites (equipped with sofa bed, microwave & refrigerator), in a three story building next to I-17 and the Black Canyon Highway, with a smallish outdoor pool & hot tub at the rear, and interior facilities of an exercise room, business center and a dining area for the free breakfast buffet. The 127-room Hyatt Place Phoenix-North faces I-17 (east side) at the busy Peoria Avenue exit, within walking distance of the Metrocenter mall, plus many other shops and restaurants; 11 miles north of the city center. The hotel is surrounded by a reasonable amount of parking space, partly shielded by trees from the interstate, and it has an outdoor pool on the sunny south side. Free hot breakfast is prepared each morning, while snacks and drinks may be purchased from a 24 hour market. Wi-fi is also complimentary. All the oversized guest rooms contain a sofa bed, wet bar and a refrigerator. The hotel also offers a fitness center and function space. Modern, economical accommodation is the main feature of Candlewood Suites Phoenix, catering to the extended stay business market though still suitable for short leisure visits. The 98 guest rooms have comfortable bedding, extra large work desk, and a full kitchen - food for which can be purchased at the on-site convenience store. Leisure amenities are an outdoor pool, a fitness center and a DVD library. Some of the rooms have views eastwards to the foothills of the Phoenix Mountains - the hotel is situated towards the north of town along Black Canyon Highway, next to I-17, half a mile from Cave Creek Park and one mile from the Metrocenter Mall. The Best Western North Phoenix hotel offers 87 modern rooms equipped refrigerator and microwave, housed in a new-looking building which is part of a group of other hotels next to I-17, bordered on the east side by the Mofford Sports Complex and Cave Creek Park. Select accommodations contain a sofa bed. To the west, on the far side of the interstate, is the Metro Center Mall together with other attractions like the Castles 'n Coasters family fun park. The hotel serves free full hot breakfast, and has leisure facilities of an outdoor pool, hot tub, bbq grills and exercise room. The well regarded Best Western InnSuites Hotel in northeast Phoenix has an excellent, quiet location along 16th Street - close to many businesses and shopping centers in the Glendale-Phoenix-Scottsdale region, but also just one mile from Squaw Peak and Phoenix Mountain Park, good for hiking and biking. Features of the hotel include better than average free full breakfast buffet, a free evening reception, well maintained outdoor pool/hot tub, and friendly staff. The surroundings are mostly residential but a few restaurants can be found 0.4 miles west along Northern Avenue. Part of a sizeable group of hotels serving the vast Metrocenter Mall in north Phoenix, the Comfort Suites has 60 oversized rooms with separate sleeping/working areas, equipped with microwave, refrigerator and coffee maker. Like many similar hotels in the area it faces interstate 17 (near exit 209; W Peoria Ave) so can be noisy at times, but the compensation is the close proximity to many shops and restaurants, and good connections to other sites in Phoenix. Leisure options are a fitness room, indoor pool and outdoor hot tub; free continental breakfast is served. Quality Inn Phoenix North lies adjacent to I-17 (exit 206 Northern Avenue) in a small business park, 1.5 miles south of Phoenix MetroCenter mall. The inn provides reliable, comfortable, mid range accommodation in 147 rooms on three floors, with south or west facing balconies and patios, and also offers an outdoor heated pool, spa, and complimentary full breakfast. There are many restaurants within a short walk of the hotel, along Northern Avenue. All accommodations are equipped with a hair dryer, refrigerator and microwave. The Travelodge occupies part of a two story building on the west side of I-17 between exits 209 and 210; 12 miles north of downtown Phoenix, 1.8 miles from Metrocenter Mall and a similar distance from the popular Castles N Coasters amusement park. A selection of restaurants are within walking distance, and continental breakfast is complimentary. Pets are welcome. The complex includes an outdoor pool, well shielded from the adjacent roads. Super 8 Phoenix Metro North is quite a large establishment, offering 123 guest rooms, in two exterior corridor buildings; a small block close to the access road (the western I-17 frontage road), and a larger block to the rear, centered on an outdoor pool and well shielded from the traffic noise. The motel has a good sized parking lot, including over a dozen truck spaces. Free continental breakfast is provided, with eight items. This location is 9 miles north of downtown Phoenix and 1.3 miles south of Metrocenter Mall. The adjacent Black Canyon Shopping Center has a small selection of restaurants.